Developer Blizzard gives players a new perspective into the popular massively multiplayer Warcraft series with its new title, World of Warcraft. See the world of Azeroth like never before, exploring expansive 3D environments that range from mountains, to deserts, to forests and more. Create a custom character from one of the many classes and races in the Warcraft universe such as Humans, Night Elves, Orcs, Tauren, and Dwarves. Online multiplayer capabilities allow for thousands of players to quest together. Ever changing gameplay varies from month to month as new missions and items are constantly updated, adding to the countless hours of adventuring. Online ONLY, Credit Card or Timecard required for continued use. 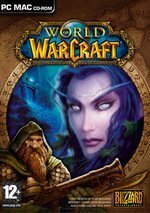 The Blizzard World of Warcraft PC Game was added to the PC Games category in June 2016. The lowest price GetPrice has found for the Blizzard World of Warcraft PC Game in Australia is $49.49 from The Nile. Other merchants who stock it are The Nile, DVD Land.